Heat pours down from the Mexican sun onto the old house, standing strong despite its crumbling bricks and mortar, shot through with tree sprouts. Heavy, ponderous tree trunks loom in every window. From her vantage point on the second-floor balcony of a nearby cultural museum, Ana de la Reguera can see the home that belonged to Hernán Cortés 500 years ago. That spot, above the city of La Antigua, is De la Reguera’s favorite place in Veracruz. “There are so many firsts that happened here,” says De la Reguera, “and it’s such an important place historically for Mexico.” That place, despite its importance, was overlooked in its greatest moment of need. Hurricane Karl, the most destructive tropical cyclone ever to hit Mexico, struck Veracruz in 2010. Five people were killed, 200,000 homes were left without power, and around 35,000 people were forced to seek refuge in shelters throughout Veracruz. Seeing the devastation of her home state lit a spark in De la Reguera. She couldn’t simply stand by. Instead, she was inspired to return to Veracruz to create her own philanthropic foundation. 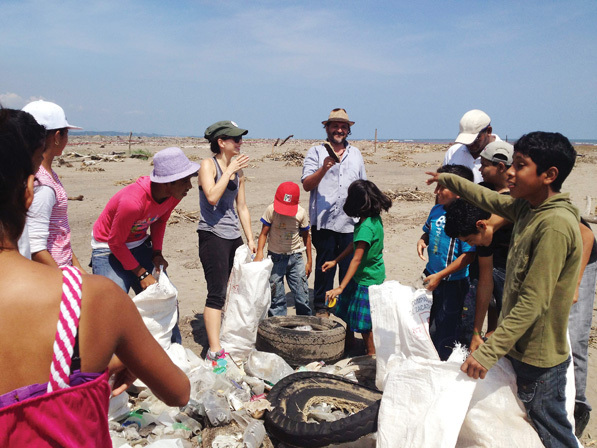 De la Reguera and volunteers clean the beach at Chalchihuecan, Veracruz in October, 2013. “I felt like I had the power to do more, and to help,” she says. “So that’s what I did.” She started collaborating with other charitable organizations in Mexico to support and help fund-raise for several groups. The work was challenging because it was difficult to convince people who already had little to donate to a charity. “In the United States, there’s more of a tradition to give back,” De la Reguera asserts. “In other countries, where the economy might be weaker, we don’t always have the culture of giving back. And it’s often additionally challenging [in Mexico] because there’s so much corruption and so much bureaucracy.” Despite the difficulties, De la Reguera knew it was worthwhile. When she returned to Veracruz after the hurricane, many people approached her and tried to hand her money. “We want to help,” they said, “and we trust you.” Her face was familiar. Her countrymen had seen her in telenovelas and makeup ads, saw how much she wanted to help, and in turn, offered their support. That kind of trust is hard to come by in an area often held back by a slow-moving government bound by red tape. The government in Veracruz provided its people with food and essential supplies after the hurricane left so many homeless, but De la Reguera wanted to go further. Government aid solved short-term problems, but she knew the true restoration and reconstruction required a long-term perspective. People who had worked for businesses destroyed in the hurricane needed to find new jobs, so she founded VeracruzANA AC to focus on rebuilding the city and building a new tourism industry in La Antigua. VeracruzANA, now in its fifth year, provides lessons in English, pottery, and other goods that can be sold to tourists and offers free art lessons to community members. The foundation improved infrastructure along rivers prone to flooding. It built parking and roads, as well as a museum open to the public that promotes the culture and identity of the community through images of the city’s historical significance. The facility also has an artistic residence program through which Mexican artists contribute a few pieces of their work to the museum in exchange for room and board. The touristic boulevard in La Antigua opened in a huge ceremony in June 2012. VeracruzANA helped transform one of Mexico’s most historic but underappreciated communities into a capital-generating tourist attraction. A virally popular Kahlua commercial starring De la Reguera brought international attention to La Antigua. The foundation even published a coffee table book called Antigua Veracruz, Lugar de Raices Profundas (Ancient Veracruz, Place of Deep Roots), which De la Reguera used her star power to promote. “That’s how it all started,” De la Reguera says. “I’m very passionate, and my countrymen trust me. They trust me because I’m happy. I’m happy to be here, helping them.” In fact, the slogan of her foundation, is “ayudar se siente bien”—it feels good to help. As she continues to promote efforts in support of her hometown, when De la Reguera returns, she’s openly stared at as she walks down the tourist boulevard she built. People approach her for photos and autographs with smiles on their faces and words of friendship and gratitude on their lips. From her viewpoint on the museum balcony, she can see her work, the first church, and Cortés’s house laid out like a story quilt. Because of her, those sights are rooted both in La Antigua’s history and its current economy. Like the tree roots that have grown in to the historic Cortés home, they aren’t going anywhere.